Update: After years of little use, I sold this car in April of 2011. Here's my long neglected Ghia, still with it's 1200cc, 36 horsepower engine. Built in 1960, in tatters by the mid '70s. Rebuilt and put back on the road in the early '80s (when this picture was taken). Driven regularly for a few seasons, then less and less until it only saw sunlight a few afternoons each summer, eventually becoming a solid but tired car that just sat in a garage for a bunch of years. I inherited the car about ten years ago and decided to put it back on the road, but with some changes. The plan was to build a vintage hot rod Ghia, using mods that could have been done back when it was new. Over the next year or two, I replaced the front beam, installed front brakes off a 356A, and then bought a Porsche 1600N engine to rebuild and put in it. While tearing that engine down, I discovered some small cracks in the case, and evidence of a major malfunction at one point. Click here for more details. Between the body being in worse shape than I had thought, and the engine needing more work than I thought, I made the decision to get the car driveable and start using it instead of spending another year or three building it. Along the way, for whatever reason I put the car in off-site storage and it was a classic case of "out of sight, out of mind". Aside from a few details, the car was ready to be put back on the road; 36 hp engine, original wheels, etc. But other projects came along and it basically sat dormant for a few years. Finally I started to catch on that I had way too many project ideas and not nearly enough time or money to get through them all. 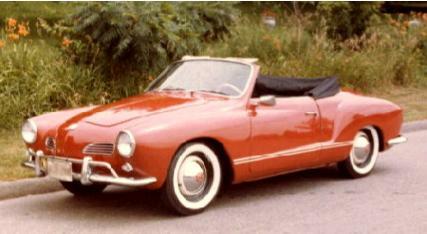 I ended up selling one of my cars (a 1966 Mustang) which freed up a space in the garage for the Ghia.. I thought with the new front end and brakes it should drive alright. The front beam seemed pretty stiff, but maybe it'd loosen up after a few miles? The "new" master cylinder gave up the ghost while in storage, so I bought more parts and converted it over to a dual circuit system. I had a hard start relay sitting around so I installed that. Then in the fall of 2007 I put in a new battery, just in time for winter. Spring of 2008. It was insured. It was registered. In theory it should run. Time to drive it. That "first drive" went pretty well. I've put about 300 miles on it now, the front end is showing signs of loosening up (yes, I greased it when I put it on) but maybe I'll rebuild the old one after all? The alignment is off but that will have to wait until the beam is worked out. The brakes are ok when underway but at slow speeds have a bit of a shudder to them - I seem to remember that from before the Porsche drums were up there so it's probably in the back. If I had to guess I'd say the new Brazilian rear drum I bought was machined off center. I had it remachined already but looking at the casting makes me think it's just wrong. The BIG issue was the tires on there were 25+ years old. Yikes. I ended up ordering new wheels, hubcaps, and tires at the same time. Everything was on backorder for over two months due to supply problems - when the wheels did show up, the original hub caps wouldn't fit (the hubcaps I want are still on backorder) but the place I got them from sent some that will fit if I tweak the clips on the wheels. Fair enough, I'm running with them until the new ones show up. UPDATE: April 2011. This car has been sold.